With its name alone conjuring thoughts of beauty and serenity, it is no real surprise to know that Rose bud Tea offers everything you’d expect, and quite possibly more. This delicate, fragrant infusion is one of our best-selling herbal teas, and with good reason, too. Aside from tasting amazing, Rosebud Tea offers some truly astounding health benefits. 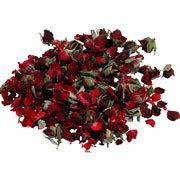 Modern science has indicated that Rosebuds and Rose bud Tea can treat PMS and menstrual cramps. It likewise reduces breast tenderness and even balances endocrine disorders. Furthermore, Rosebud Tea can stabilise emotional ups and downs, essentially balancing the mind in a way that makes this brew an excellent choice for women and men alike. Perhaps most important of all, however, is the fact that this herbal tea tastes great. What more could you possibly want from your morning, afternoon, or evening cup? What about less caffeine intake? If this is the case then Rose bud is the beverage for you, as it is completely caffeine free! Buy this tea today and see what it can do for you. We guarantee you won’t be disappointed. We are all familiar with the Rosebud; most of us know it on the stem of a beautiful plant rather than in the bottom of our teacup. The rose is a woody perennial flowering plant of the Rosa genus. This genus belongs to the Rosaceae family. The Rosebuds we use in this tea usually consist of four to five petals, with each petal divided into two distinct lobes. When they are not blessing your taste buds, roses are best known as ornamental plants grown for their stunning flowers in the garden. This kind of cultivation dates back some 5,000 years, although the rose is, according to fossil evidence, at least 35 million years old. Perhaps most famous of all, during the 15th Century, the rose was used as a symbol for the factions fighting for control in England. The white rose symbolised York, and the red rose symbolised Lancaster. As a result, the conflict became known as “The War of the Roses” (1455-1487). But here at The Kent and Sussex Tea and Coffee Company, we believe in making tea, not war. That’s why our Rosebud Tea is a personal favourite of many here at our Pluckley-based Factory. We are likewise certain it’ll be your favourite, too. How to Serve: Owing to the delicate flavour of this tea, we recommend serving it without any accompaniments. Tasting Notes: The aroma of this brew alone will evoke wonderful memories of strolling through Rose Gardens on a warm summer’s day. The taste, meanwhile, consists of sweet, floral flavours perfect for morning drinking. Health Benefits: According to some studies, a cup of Rose bud Tea a day can help reduce ageing and keep your beauty for years to come. Experts have long established that Rosebud Tea consumption can help remove dark spots and increase pore stability, which means less clogging and PH level issues. Essentially, this beverage improves skin health down to the last blemish. Furthermore, herbal teas such as this one are rich in antioxidant compounds that can, when consumed as part of a healthy and active lifestyle, neutralize free radicals in the body. This, in turn, can aid with cardiovascular health, as well as reduce the risks of Type II Diabetes.